Rebekah, the maker of the most lovely upcycled rabbits in the world? Also otherwise known as the creative force behind Dandelion! Definitely more sugar, I'm a lover not a fighter! How did your business Dandelion come about? I have always enjoyed sewing & making things for my five children and this led me into starting up a small business from home. I also have a passion for op shopping and vintage fabrics. On a visit to the Creswick Woollen Mills I fell in love with their amazing alpaca blanket offcuts & saw huge creative potential. I wanted to create a toy that combined a variety of recycled materials and that is how my Blanket Bunnies were born. 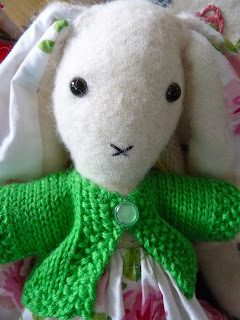 My mum helps out by knitting the girl bunnies gorgeous little cardigans using Australian wool from the Victorian Tapestry Workshop in South Melbourne. I am now making boy pirate bunnies too. Since Dandelion began I have made hundreds of bunnies who have gone off to loving homes all over Australia & the world. Knowing that one of my bunnies is part of someone's life, a part of their childhood, is the best feeling ever! What is the number one thing you can not leave the house without on market day? My eldest daughter, Charlotte, who is the best helper in the world! What has been your best purchase at a market? It would have to be my super ace sky- blue flowery leather purse that I picked up at Paddington Market this year. It always makes me smile. Where else can we catch you? You can visit me at my blog www.dandelion-beck.blogspot.com, or via my shop www.dandelion.bigcartel.com, or at Sugar & Spice in Ballarat & Woodend. Come and say hi! How could you say no to taking one of these home? I do love Becks blog & her bunnies are just adorable!